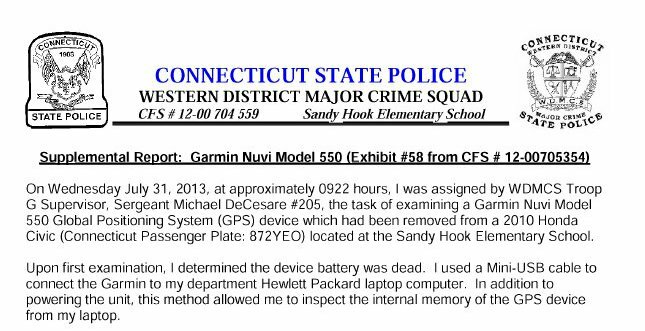 When police searched the Lanza home on the evening of December 14th, they recovered a Garmin Nuvi 200 GPS unit. They quickly determined that this unit was from the shooter’s car, and thus all recent data in it would reflect trips that the shooter drove. Key among these trips is one from December 13th, 2012: the day before the shooting. 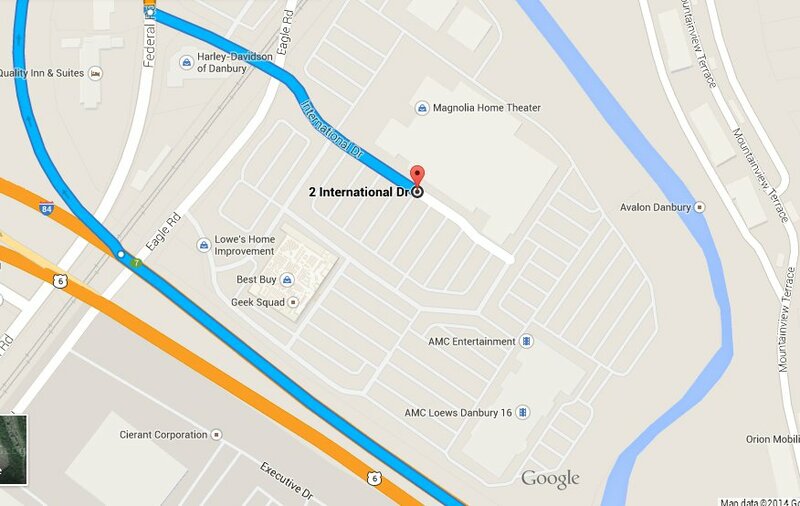 In this trip, the shooter drove to, and just past, Sandy Hook Elementary School. Note that the time of day cited for this trip was 2:09pm, and ended at 2:32pm. 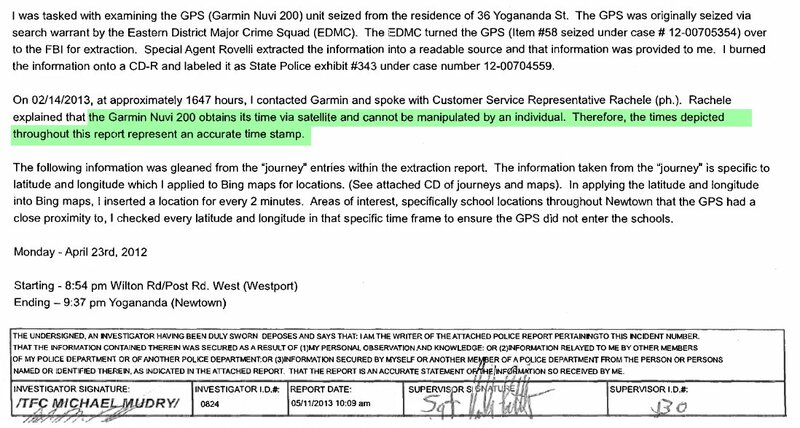 Unfortunately, it seems that they did not clarify with Garmin that, while the time stamps are accurate, they may not be adjusted to match the timezone where the trips took place. Obviously, both reports cannot be true: the time stamps in this report change from a start of 2:09pm, and end of 2:32pm, to a start of 9:09am and an end of 9:32am. That’s a difference of exactly 5 hours. 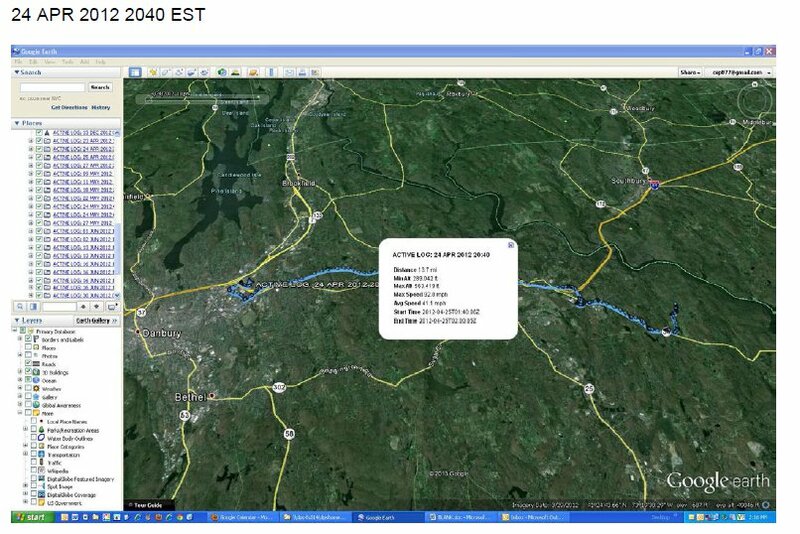 Connecticut is on Eastern Standard Time (EST) in the United States. EST is also expressed as GMT-5, or UTC-5 (Greenwich Mean Time, or Coordinated Universal Time). It’s exactly five hours behind GMT, in other words. Thus, I submit that the 9:09am trip time is accurate, as it was adjusted to EST, and that somehow this step was missed in the official report summary. The official report claims that the shooter left his home at 1:40am, and arrived at 2:00am at his destination, where he remained for approximately 3hrs and 15minutes. This is the same theater where the shooter was known as “DDR boy” for his marathon gaming sessions on the Dance Dance Revolution arcade game in the theater’s lobby. It’s not open 24 hours a day, though. Like most movie theaters, the last showing would not extend much into the after-midnight hours. This makes the time stamps from the second report, which start at 8:40pm EST on the 24th for the trip to the theater, and 12:16am EST on the 25th for the return trip, much more likely. 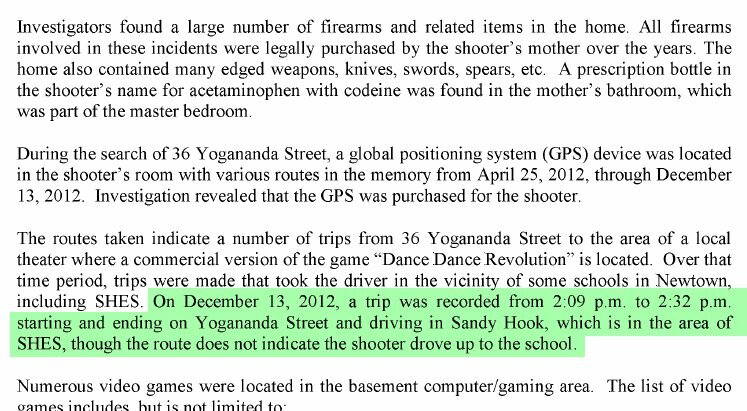 In fact, it’s quite possible that the shooter (given his documented interested in the subject) was at the movies to see a showing of Disney’s “Chimpanzee” which was showing there at the time… but it’s just as likely he was playing Dance Dance Revolution the entire time. The important fact to take away is that here, the EST adjusted time is the only reasonable version of events, and thus we can conclude that it is accurate for the trip past Sandy Hook Elementary as well. And, thus, the version of events portrayed in the official report is wrong. Now that we know that the shooter drove past Sandy Hook Elementary School between 9:09am and 9:32am on the day before the shooting, we can more accurately infer the purpose of that trip. As the (accurate) report notes, this trip was not just to the scene of the crime on the day before it occurred, but very nearly or even exactly 24 hours before it occurred. The assault on the school (beginning when shots were fired to create a hole in the glass next the school’s entrance) is listed in the report as starting at “shortly after 9:30am”. This is a rather fuzzy time to cite, but it seems based on the fact that a 9:30 meeting was already in progress at the time, given the victims in the meeting room, and the first 911 call received at 9:35am (and 39 seconds). The shooter parked and waited to verify the appropriate “start time” for his crime the next day, either listening for the school bell or waiting for all of the school buses to depart; essentially, he we collecting reconnaissance. …the first being the most likely, in my opinion. This entry was posted in Uncategorized and tagged adam lanza, GPS, nancy lanza, Official Report, Sandy Hook Elementary School shooting. Bookmark the permalink.